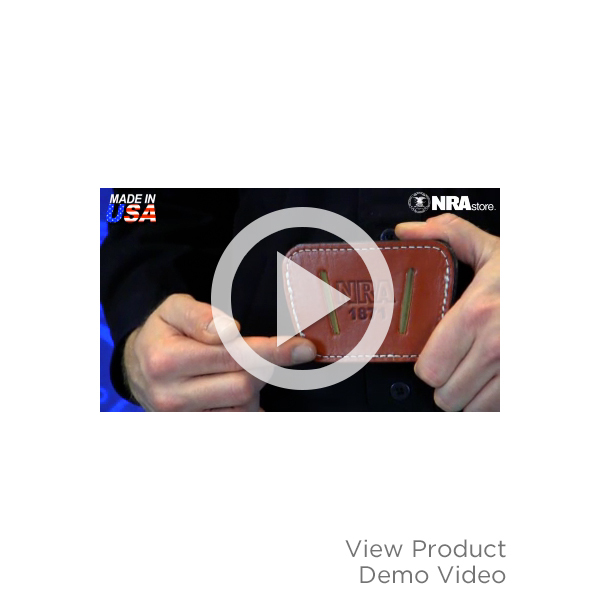 One of the NRAstore’s most popular products is now made in the USA! Our best-selling Slide Holster just got better. It’s still the same simple, versatile, genuine leather holster, but now we’ve added a smooth, suede-lined interior so it’s gentler on your pistol and easier to draw/re-holster. With multiple carry options you can wear it clipped to your belt, or remove the clip and slide your belt through the 1 ¾” slots. The versatility doesn’t end there – the Homeland Slide Holster is ambidextrous and can be worn inside or outside the waistband, and even in the small of the back. The Small size fits small to medium frame semi-autos from .22 - .380 and the Large size fits medium to large frame semi-autos 9mm - .45 (over 6” overall length, including the 1911). Available in Black or Brown. Please specify size and color when ordering. Made in USA. I had this holster for years and I improved on it by, with a razor blade cutting two more belt slots to the outside of the two existing slots. It now holds the handle of the gun much tighter against my side and it a lot more comfortable. I purchased this for both CCW and bedside. My single complaint is lack of any retention system when outside. I purchased years ago with NRA "Bedside Caddy" ("L"-shaped metal device fit between mattress & box, holds this holster & firearm) which is a product I'd recommend if you find it again. I've used my G19, Sig 229 and Perf Center M&P Shield in holster. Generally pleased with it. I purchased this holster for the new Ruger LCP II. I had difficulty locating a holster that would fit this particular model. The holster was received within 2 days of the order placement. The quality is excellent and the holster is so comfortable that you tend to forget that it is there, which could be considered a negative. I wish there was some form of retention for this holster as the LCP II does not fit as snugly as I would prefer. There is little resistance when drawing the LCP II from the unit. This was the small edition for this item. Purchased to use for OWB carry of Glock 32 at home and while working outside. Very comfortable and convenient for this use. Conceals OK with a loose shirt. I am very pleased with this holster; made in USA, reasonable price, and has the NRA logo. Excellent little holster. I have a Berretta 72S .380, and had shopped the internet for months, no one had a holster that fit. This holster although simple and generic to any gun, fits my Berretta perfectly. I never thought of the NRA in my search for a holster, until I renewed my membership online. If you can not find a holster for a unique gun, this is the one to buy. I use this holster to carry my M1911. Because it snugs the pistol high and tight against my side it is completely concealed with nearly any shirt I wear. If the grip wasn't so long it would disappear under a T-shirt. The draw is flawless without any snagging from the sights and once it is broken in it is a snap to re-holster. I can't imagine a better holster for the price. Excellent well made holster. I had a problem finding a holster for the new custom Ruger LCP. It has sights that are a lot better than the original LCP, they are raised giving a much better sighting system. This holster fits the gun perfectly in the small size. I also like the carry option's of this holster. I also like the interior of the holster that will not scar your weapon.